The idyllic surroundings of La Bagnaia Golf & Spa Resort Siena, Curio Collection by Hilton provide excellent activities for those looking to explore. 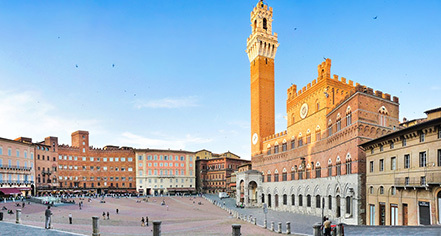 The city center of Siena, just 12 kilometers away, is a UNESCO World Heritage Site, and one of the most famous Italian cities that attracts major tourism during a trip to Tuscany. Enjoy wine tasting, delectable authentic Italian food, drive a vintage FIAT 500 on a tour, bike the countryside, or peruse the artisan shops in the city in the historic district. The staff at La Bagnaia is happy to share information on local tours, festivals, wine tastings, and other activities in the area. One of the most famous Italian cities and a place every tourist aims to visit during a trip to Tuscany. It is famous for its Palio Horse Race that takes place twice a year, and Piazza del Campo, one of the biggest medieval squares in the world, and it's Duomo, the medieval church. A small walled medieval hill town in the province of Siena, it was originally an Etruscan village. 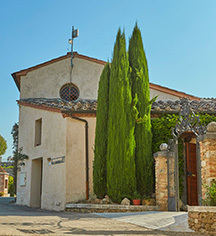 Named after the bishop of Modena, San Gimignano, is known for its white wine, Vernaccia di San Gimignano, produced from the ancient variety of Vernaccia grape which is grown on the sandstone hillsides of the area. Monteriggioni stands on top of a hill dotted with olive trees and vines. This perfectly preserved medieval borgo represents one of the most important walled castles in the territory. One of the most beautiful areas in the whole region, it extends over the provinces of Florence and Siena, covering all of the area between the two cities. Famous for its vineyards and olive groves, the region offers incredible views and many wine and food tours.